The Nurse Manager/Patient Educator Doreen Petrone, RN leads the nursing staff. She has been with Dr. Nazha since he opened his practice in 1990. Doreen is committed to assuring that she and the entire nursing staff provide quality and compassionate care. Our registered nursing staff provides patient and family education. This education includes information about the disease process, the chemotherapy drugs, drugs used to prevent the side effects of the chemotherapy, as well as nutritional needs before, during and after treatment. Our full time registered nurses, Doreen, Margee, Jeannie, Donna, and Kelly are chemotherapy certified. We are also glad for the assistance of our part time and per diem nurses, Toni, Anna, and Karen. 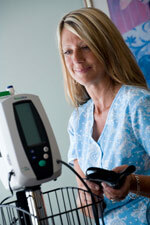 Our nursing staff is dedicated to professional development, enabling us to stay at the forefront of cancer treatment. For more information on our Medical Oncology services Click Here.